Mr Green is always surprising their players with new promotions every week. These promotions give players a chance to win extra prizes, and they add a little more excitement to the games. This week, the casino is hosting a €10,000 cash drop promotion, where 100 random prizes are distributed to participating players. You can take part in this promotion by playing the three Yggdrasil slots Golden Fish Tank, Hanzo's Dojo or Vikings Go To Hell. The minimum qualifying bet is €0,75 per spin (real money), and each spin will give you the chance to win a random cash prize. A total of 100 prizes worth €10,000 are randomly given to players. The top prize is €1,500, and prizes are credited to the player accounts immediately as cash that can be withdrawn. Make sure that you read the terms and conditions of the promotion, as well as the general bonus terms. Take a look at the website to find out if you are eligible to participate in this promotion. Check Out the Mr Green Cash Drop Promotion! 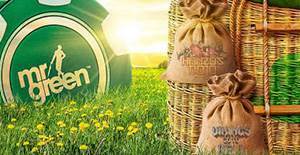 Mr Green online casino has been operating for over 10 years now, and they have gained a fantastic reputation among players. They have proven their trustworthiness over the years, especially when it comes to paying out winnings. One of the specialties of this casino are also the many changing promotions that players can enjoy every week. You can find hundreds of games from many popular software developers, including Amaya, Bally Wulff, Netent, Play'n GO, Yggdrasil, Betsoft and Nyx Gaming. You can find out more about the casino in our detailed Mr Green review and find out about the payments, bonuses, terms and games.